We have known that Google has been working on a mobile index that would be completely separate from the desktop index. At SMX Advanced last week, Gary Illyes from Google shared many more details about the possible mobile only index that has many SEOs excited. The limitation of the current index is that historically, Google could only index one piece of content per individual URL, so this is what they are looking to change, so that they could have two pieces of content per URL – one for desktop with the other for mobile. He said one of the issues they are dealing with is that people don’t tend to link to the mobile version of a URL, when there are separate URLs for mobile versus desktop. But with PageRank being an important ranking factor, they are unable to assign that PageRank to mobile URLs that nobody links to. With it being an important signal, they need to solve the problem of assigning PageRank in these cases. Illyes says that they are currently experimenting with the separate mobile index now, but he didn’t reveal details specifically with their experimentation. Yes, the reality of having a separate mobile index just might not happen, due to the many challenges they are working on. 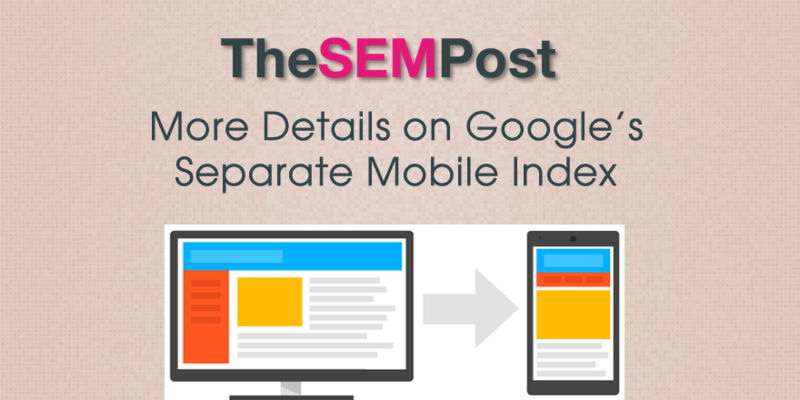 But Illyes feels that Google should move towards this dual index for mobile and desktop. He says this is a huge change for Google, so it is nothing that will launch within the next few weeks, if it does indeed ever launch. As Google continues to work on dual indexes, the regular one for desktop and a separate one for mobile, SEOs are definitely keeping a close eye on details, especially since two indexes could mean approaching mobile SEO in a different way, not to mention the affect it could have on how SEOs create their mobile friendly site and structure.